Takashi Murakami’s work is invested with the synthetic flawlessness of the television screens.There seems to be something intrinsically enchanting about Takashi Murakami’s works, which have dominated not only the Japanese local art scene, but also the international contemporary art world for the past decade. Since emerging onto the contemporary art scene, Takashi Murakami’s work has greatly challenged all that is held as sacred and sacrosanct within the domain of high art. Takashi Murakami has progressed as an artist to a level where his name can be heard in the same breath as Andy Warhol, Jackson Pollock and Willem De Kooning. Takashi Murakami has successfully joined the upper echelons of the artistic hierarchy in the twenty first century. 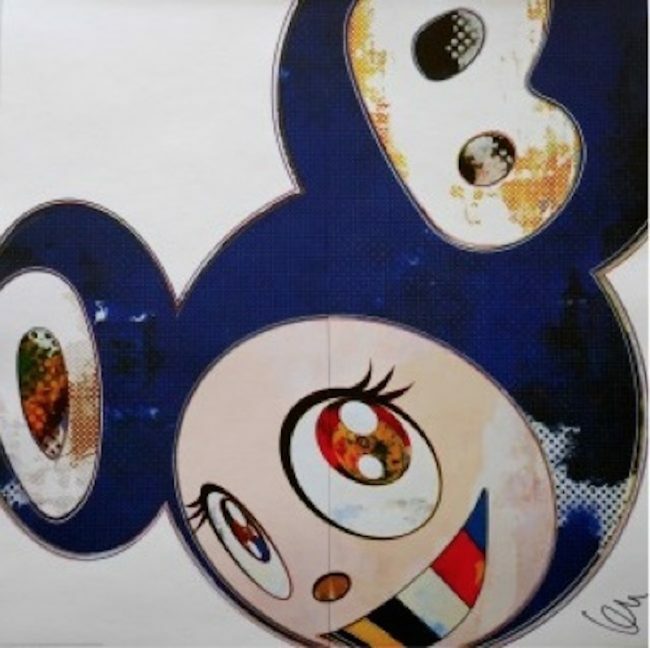 A lightning rod between different cultural valencies (high/low, ancient/modern, oriental/occidental), Takashi Murakami has stated that the artist is someone who understands the borders between worlds and who makes an effort to know them. With his distinctive “Superflat” style and ethos, which employs highly refined classical Japanese painting techniques to depict a super-charged mix of Pop, animé and otaku content within a flattened representational picture-plane, he moves freely within an ever-expanding field of aesthetic issues and cultural inspirations. Parallel to utopian and dystopian themes, he recollects and revitalizes narratives of transcendence and enlightenment, often involving outsider-savants. Mining religious and secular subjects favored by the so-called Japanese “eccentrics” or non-conformist artists of the Early Modern era commonly considered to be counterparts of the Western Romantic tradition, Murakami situates himself within their legacy of bold and lively individualism in a manner that is entirely his own and of his time. Takashi Murakami is widely recognized for his ability to adapt the aesthetics of Japanese traditional art to operate within the context of popular culture.Murakami studied Japanese painting at the Tokyo National University of Fine Arts and Music, where he received a Bachelor of Fine Arts degree in 1986 and a Ph.D. in 1993. After completing his studies, he increasingly displayed his works in solo and group exhibitions, making his European debut in 1995 in “ TransCulture, ” held at the 46th Venice Biennale. The following year Murakami’s paintings and sculptures were featured most notably at the second Asia-Pacific Triennial of Contemporary Art at the Queensland Art Gallery in Australia.